Within the walls of the convent, the sisters daily pray to God for peace, along with constant repetition of the Psalms and the prayer rule of St. Pachomius the Great. PRAVMIR. On July 4, 2014, at 4:00 AM, the Ukrainian Army carried out an artillery strike on the Lugansk Regional Clinical Cancer Center, on whose territory is located a convent in honor of the Holy Martyr Grand Duchess Olga. There have been no human casualties. 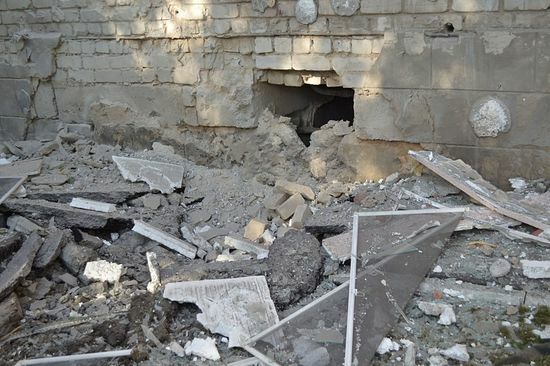 The church and the monastery’s grounds were not affected; however, shells and shrapnel damaged the clinic’s building and its various offices, relates the monastery’s website. Within the convent, the sisters daily pray to God for peace, along with the constant recital of Psalms and the performance of the prayer rule of St. Pachomius the Great. Priests of the monastery’s St. Panteleimon Church daily serve the Divine Liturgy, as well as read prayers and Akathists (up to 40 daily) for the protection of all Donbass residents from gunfire and destruction.